I can't believe it's been a month already! August flew by like it was nobody's business. 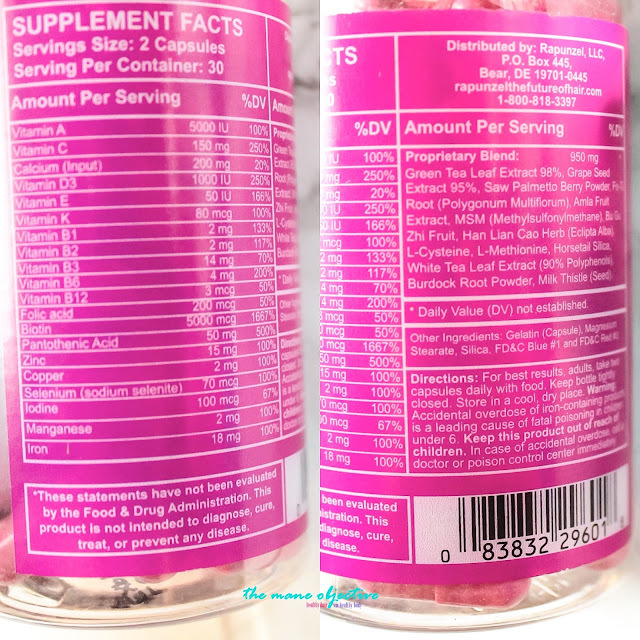 I'm super excited to share with you my experience using Rapunzel the Future of Hair HairTherapy vitamins! I asked some of you guys on Facebook and Instagram if you had any specific questions you wanted answered about the vitamins - so let's get cracking. I'll start with my results, some general info, and then the questions you all asked. 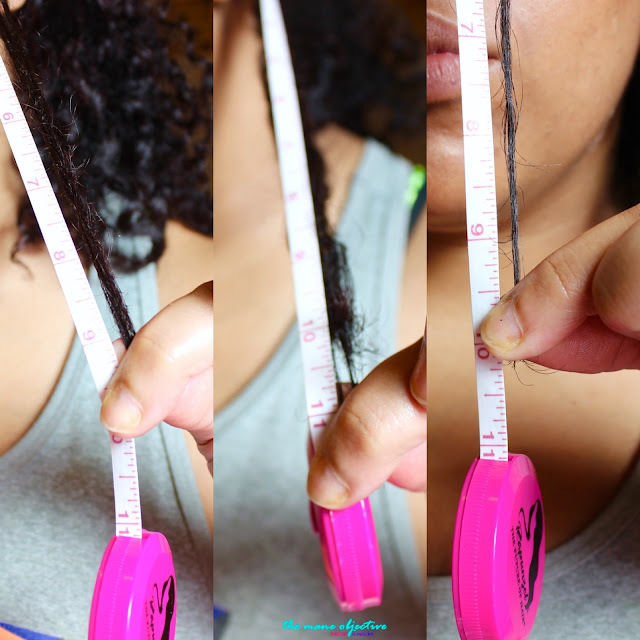 Click here to see my starting hair measurements and why I'm doing this challenge. Measurements L to R correspond to the numbers below. Y'all know what that means right? 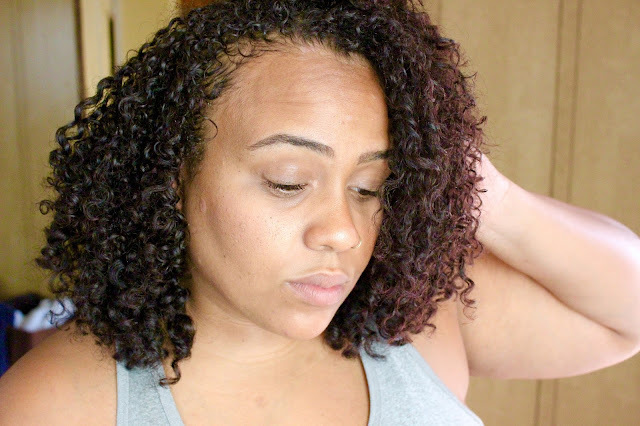 In 30 days, I experienced a full INCH of hair growth! No shenanigans! For reference, my hair grows about 1/2 to 3/4 of an inch per month. With Rapunzel HairTherapy vitamins, I'm a full inch in. That means by the end of October, I'm looking at an extra 3 inches of hair instead of the typical 1 and 1/2 to 2 and 1/4 inches! Yasssss! **Now, on to this double askterisk business. You probably looked at that back left number like, how did you lose hair?! Here's the thing. About 3 weeks into my vitamin, I realized my hair wasn't quite right. Even though I had jussssst got a cut at Be Kekoa at the end of July, somehow my shape was not on point anymore. The culprit? The back half of my hair. See, the back half of my hair has a looser curl pattern and less shrinkage. This means that accelerated growth is more apparent - and is exactly why my cute curly shaped cut was looking less cute, and less shapely. So if my math is correct (and I'll admit, sometimes it ain't), had I kept that inch and a quarter, I'd be looking at 12 and 1/2 inches along the back of my head. The final reason I went ahead and cut, was to give the front, more shrinkage-prone areas of my hair a "leg up" on the race to help maintain my shape for the long-term. Hopefully it works...because I know these vitamins shole do! Judging by the results I shared previously, I'm inclined to say yes. Although I'm only 30 days in, the results are there. I'll have a more definitive answer for ya come day 60. I make no claims to be a scientist. Are they better than Mane Choice, Mielle Organics, or Hairfinity? I can't tell ya. I've never taken Hairfinity, and I still have a half empty Mielle Organics vitamin in my collection (I took em on and off for two weeks a few months ago, nothing major to report there). I did take the first Mane Choice formula, but they've since released a plus that I have yet to try. At the end of next month, I'll do a definitive comparison - because I took Manetabolism vitamins for 2 months. Everyone's concern, right? The most annoying thing about vitamins is the potential to fix one problem while creating another. While biotin can cause breakouts, it can be curbed with the addition of zinc - which HairTherapy contains. In this first 30 days, my skin got no better or worse than it already was. I don't have perfect skin (Lord knows I need to order me some more Ashley's Naturals Pumpkin Mask and drink ACV every night), but I didn't notice any discernible changes in my skin. Did they give you energy or keep you awake? For reasons that I'll share a little down in y'alls questions, I switched to taking HairTherapy at night. The vitamins didn't keep me up at all (I really do be in bed by 10 lol), and I had no trouble getting to sleep after taking them. As far as daytime energy, I can't tell ya. But full disclosure - I do take a pre-workout (Cellucor C4) which contains caffeine, and probably lends itself to me having a lessened sensitivity to any energy-boosting components of HairTherapy. Yassss to the shape filling in and growing out! No, no extra poots on HairTherapy. Why did I even answer this? +Antoinette Arrington, I can't take you seriously. LOL. How much are they? How many did you take? Any information about the company? The vitamins are $24 for a 30 day supply (60 count). I take two per day, per the instructions on the label. Rapunzel the Future of Hair is a Black-owned business, founded by Rasheda Stewart in 2010. Rasheda launched Rapunzel the Future of Hair while pursuing her second Master's Degree in Marketing Management, after hitting a wall with her own hair growth. Like many with an entrepreneurial spirit, she decided to take matters into her own hands - creating a company focused on dispelling the myth that Black hair can't grow. And 6 years later, here we are. Growing hair and whatnot. Did you increase your water intake? Yes and no. I increased my water intake in general, as a part of my overall mission toward betterness doing and optimal health. And since #30DaysofDope is here, and I'm all on a meal plan - my beverage of choice (and by force) is water in various forms. Plain and cold. Bubbly with no sugar. Decaf. Lol. But to answer the question, I drink 60-80oz of water daily. I'm aiming for more, but hey. 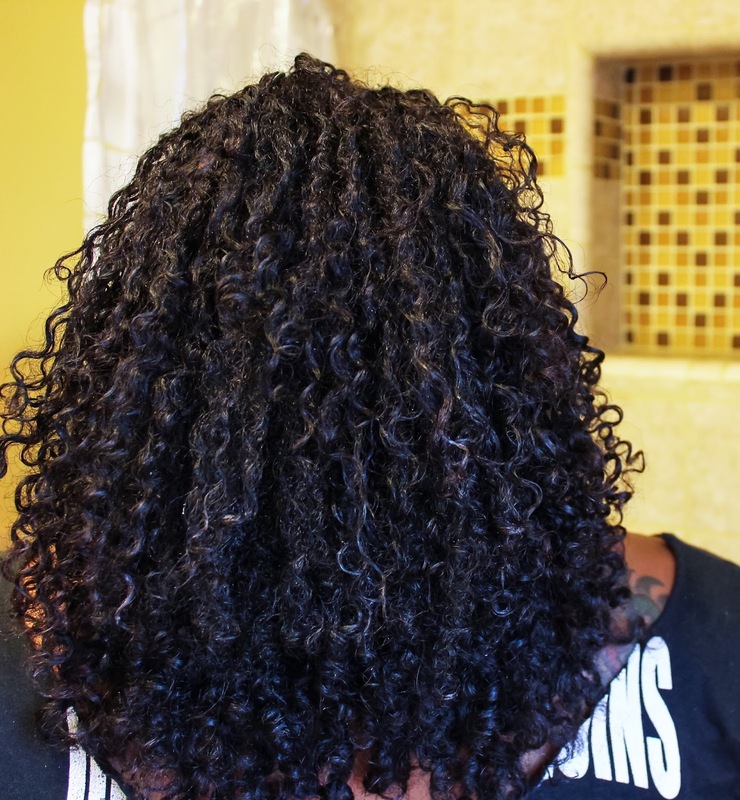 Did you notice more overall thickness or fullness of fro, or actual growth? I gotta admit, my hair is feeling fuller these days - reminding me of a young ManeObjective circa 2014. My hair may look "smaller" here than the back of the head view from the top of the month, but let me tell you. In that pic, my hair had been banded and pineappled for stretch and fluff realness (visual reference here). In the picture below, my hair is fresh out of the banana clip and scarf situation - with shrinkage in full effect. With that considered - not bad at all. One last tidbit about fullness and density - I didn't notice any decreases in shedding with HairTherapy. Y'all...hair sheds. It's supposed to shed. 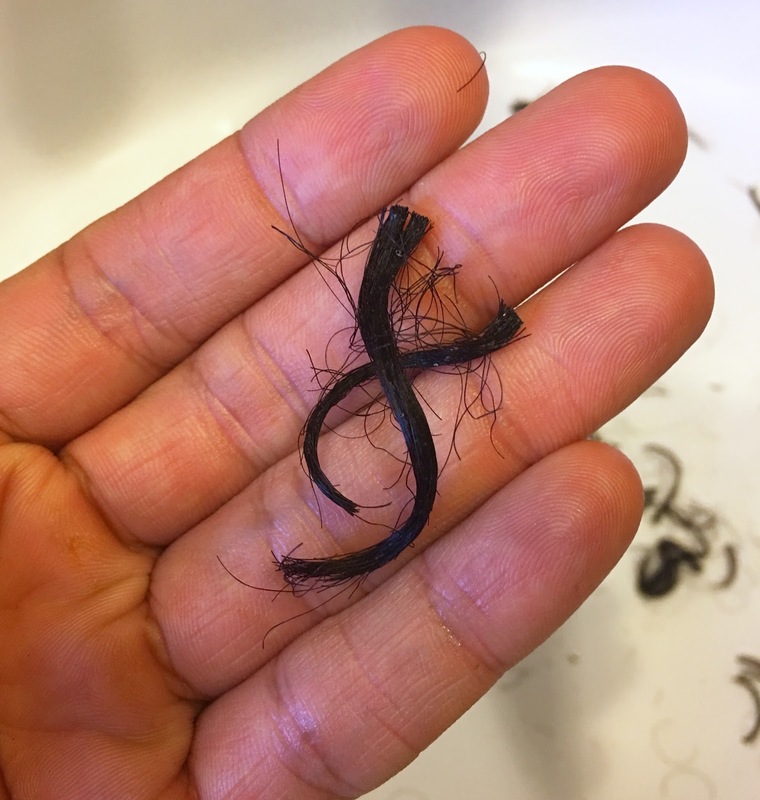 It's a part of the growth cycle of hair. Circle of life and jazz. What freaks me (and most people out) is experiencing a decrease in shedding while taking a particular vitamin, stopping, and practically going bald. So while I feel like the density of my hair is on track for greatness, I'm confident that when I stop taking HairTherapy, life will go on without adverse impact. Do they make you nauseous or sick? Remember when I said I had a note on taking the vitamins at night? Let's clear that up. First of all, the vitamins themselves didn't make me nauseous or sick. On GP. However, I experienced something quite uncomfortable one day, when I took my vitamins and then immediately after, took my pre-workout powder. Don't ask me why I did it, sometimes I have lapses in judgment. Needless to say, the combination of the two sent my tummy into turmoil. Lesson learned. So now, I take HairTherapy at night, right before bed. This ensures that whatever pre-workout is out of my system, and I go to bed a happy camper. For what it's worth, I wouldn't even eat a meal and drink pre-workout. Same sitch. Do they make hair grow on other undesired areas? You know what's funny about this? I expected my eyebrows to be a hot mess. To have hairy legs and pits. But as the good Lord saw fit, my hair everywhere else is growing at a normal rate. No twice a week visits to the eyebrow lady. I wish I could tell you guys definitively that my nails were growing - but I keep them cut short on purpose. Perhaps I'll do a gel mani this weekend to visually track that growth. Maybe. Well guys, I hope I answered all your questions. Stay tuned for month 2! Note: I am not a licensed medical professional, and this blog post does not contain information to be used as medical advice. Again, this post is not a substitute for the advice and expertise of a licensed healthcare professional. As with any supplement, check with your doctor first. Per the FTC, I have to let y'all know that this post is sponsored by Rapunzel the Future of Hair. But that doesn't mean anything - I'm still keeping it 100 and giving you guys the real. I Love Rapunzel the future of hair!!!! I have been using this product since it launched!! !I ♡♡♡♡ the protein deep conditioner & Silk the daily oil! Girllll who you tellin?! That Hair Lotion is my ultimate fav. I forgot how much I loved it - so glad I started using it again!! !